Size of Male: 110-150 lbs., 29 in. Size of Female: 80-120 lbs., 27 in. The Anatolian Shepherd Dog is a very ancient breed. They probably originated in Turkey more than 6000 years ago. Since that time they have been used as livestock guardian dogs which are different from herding dogs. Instead of herding livestock they protect their flocks from predators. 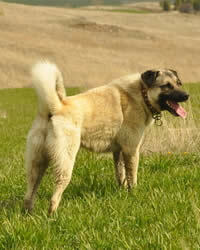 Anatolians are a large, powerful dog with a guard dog’s instincts who is not always easy to train. They tend to think for themselves and they are very suspicious of strangers.These dogs are not recommended for first-time dog owners or for anyone who has trouble controlling a dog. The Anatolian Shepherd Dog originated more than 6000 years ago in Asia Minor. They share similar roots with other livestock guardian dogs in the region. The Anatolian was developed to protect flocks from predators. Breeders created a dog which could withstand Turkey’s harsh climate and live the nomadic lifestyle of the shepherds. The dogs also have similar coat coloring and size to the animals they guarded so they could blend into the flocks – unnoticed by predators. The coat can be rough or short, depending on what the shepherd needs. Today these dogs are still used to guard herds and flocks on ranches in the American west. Anatolians are very intelligent dogs and they are quite capable of making decisions for themselves. This is useful when they are guarding flocks. However, it means that they can be slow to follow commands from their owners. Dog training is very important with this dog breed, especially if they are to be family dogs. They are very devoted to their families and very loyal. They are also very loving dogs. They are generally calm and reserved, even around strangers, but they are always guard dogs at heart. Although they do like children, this breed must always be supervised around them. This dog breed is not recommended for first-time dog owners or for anyone who has trouble controlling a dog. These large, powerful dogs are usually too much dog for someone unless they are an experienced dog owner. They do tend to be dominant dogs unless they are taught from an early age that their owner is in charge. Anatolians do get along well with other animals. Living Environment – Anatolians today are still used as livestock guardian dogs so they are well able to live and thrive outdoors. If you plan to use these dogs for flock guarding you should not keep them in the home since they will have trouble re-adapting to living outside. Otherwise, you can keep them indoors, as long as they get plenty of exercise. Exercise is very necessary for this breed for both mental and physical reasons. They do require a large yard of their own. They are not recommended as apartment dogs. Grooming – Grooming for an Anatolian is very simple. They need to be brushed and bathed occasionally. They are normal shedders. Diet & Exercise – This dog breed has normal dietary needs, though they are large dogs so they eat a lot. They do require a great deal of exercise. It’s good if they have their own large yard but they also need some directed exercise. They prefer to have a job to do. Health – Anatolians can be prone to canine hypothyroidism and to entropion (and eyelid problem). Canine hip dysplasia also occurs in the breed. The breed is said to be sensitive to anesthesia so talk to your veterinarian before anesthesia is administered for these dogs. Anatolian Shepherd Dogs are very intelligent and they are quite capable of thinking for themselves. However, this can make training these dogs difficult. They may not always follow commands either quickly or exactly as given. Dog training must persistent and determined when training an Anatolian. As you might expect, it would be very difficult to use physical force with such a large dog. Training should begin early and positive dog training methods should be used (praise, treats). Try to make training fun for your dog and encourage him to enjoy pleasing you. This breed should definitely be socialized from an early age so they will be more accepting of friendly strangers.